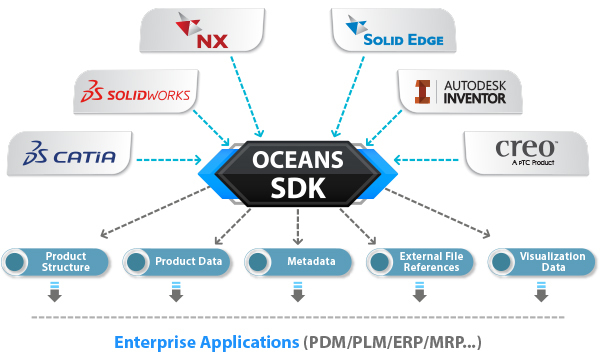 Oceans SDK (OSDK) is CCE's proprietary technology that allows enterprise applications to work with product data in CAD files without access to the CAD software. Enterprise applications such as PLM, ERP, MRP etc. currently achieve this is by using expensive royalty-based API's licensed from CAD software OEM's and creating individual plug-ins for each supported format. Using OSDK simplifies the application architecture without compromising on the functionality. 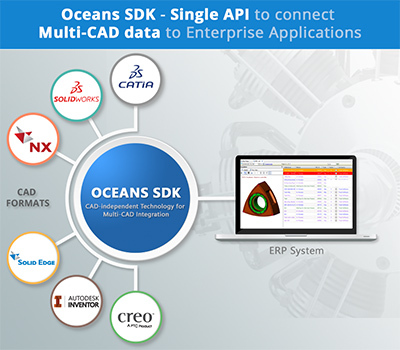 FARMINGTON HILLS, Mich. – (Feb 20, 2018) – CCE, a leading provider of advanced interoperability technology, announced an update to Oceans SDK (OSDK), a first-of-its-kind technology for 3D CAD integration in enterprise applications. OSDK provides access to native product information stored in files of all major 3D CAD formats, via a unified API architecture, and without the need for a CAD license. In the first major release of 2018, OSDK has been enhanced to support all the latest CAD versions from formats like CATIA V5, CATIA V6 (3DXML), SOLIDWORKS, NX, Inventor, Creo, Solid Edge and JT. OSDK was also enhanced to provide "edit" capabilities for file properties to help propagate changes done on the enterprise application side, back to CAD, thereby updating the source CAD data and repairing broken file references. Edit capabilities are currently available for CATIA V5, SOLIDWORKS and NX formats. OSDK is the outcome of fifty man-years of complex interop software development based on CCE’s well-known ODX libraries that provide native access to major CAD systems, and is currently used by leading Independent Software Vendors for their CAD-independent viewers and translators. "Today’s globally competitive marketplace demands manufacturing companies deal with complex products and shrinking development times. This creates the need for a synchronized workflow from design and engineering through manufacturing and delivery. Real-time visibility is critical to making time-sensitive decisions on procurement from the extended supply chain. Tools like Oceans SDK that help reduce complexity and cost when interfacing with multiple CAD formats provide a significant competitive advantage for enterprise application providers and help them win new business and grow profitably”, says CCE's V.P. Sales & Marketing, Vinay Wagle. OSDK provides an easy, plug-and-play solution to all such enterprise application providers, thereby providing them with a significant edge over competition. OSDK’s single API for all the CAD formats makes the integration development very simple and keeps the maintenance costs low. OSDK can also be used to develop lightweight browser-based CAD interfaces for ERP/PDM/PLM systems in addition to desktop-based integrations. For additional information, please visit http://www.cadcam-e.com/development-tools/oceans-sdk.aspx. OSDK is available as a C++ API. It is based on CCE's robust ODX libraries that are currently used by leading CAD/CAM/CAE Software Vendors (ISV) for their CAD-independent viewers and translators. Get greater insight into data that Oceans SDK provides access to. Simple Integration: OSDK's unified API for all major CAD systems enable enterprise applications to create a single integration to work with CAD data from multiple sources, thereby making initial development very simple and keeping on-going maintenance costs low. Single Vendor: OSDK's multi-CAD support helps enterprise software companies work with a single vendor to implement CAD interfaces, thereby greatly simplifying vendor management. Lower Skills: CAD expertise not needed. Lower Cost: OSDK is completely CAD-independent. As a result, enterprise application users no longer need to invest in expensive CAD software/licenses to work with multi-CAD data. Simpler IT Setup: Since OSDK has a unified architecture and provides support for multi-CAD data via a single solution, software and license management is very simple and reduces the overall IT support overhead for users. OSDK provides read & edit* API for native multi-CAD data. OSDK is a first of its kind CAD-independent technology that allows enterprise application vendors to propagate changes done to file parameters/properties in their software, back to the CAD side, thereby updating the source CAD data and repairing broken file references. OSDK works with assemblies, parts and drawings of all major CAD formats. If you need specific details of APIs available for read and edit access respectively, please contact oceans-sdk@cadcam-e.com. For additional information, contact oceans-sdk@cadcam-e.com with your specific requirements.